1/5/10: Contract Year Wonder - The Texas Rangers have won the gullibility sweepstakes, signing third baseman Adrian Beltre to a six-year, $96 million contract. Beltre, who turns 32 in April, has had two spectacular seasons: 2004 and 2010, both contract years. In his 11 big league seasons outside of 2004 and 2010, Beltre has an RSL of .264/.318/.435. There is some hope for Rangers fans. Beltre represents a huge upgrade defensively at the hot corner over Michael Young, who shifts to designated hitter. In fact, over the past three seasons, no third baseman has saved more runs defensively than Beltre (55) and none has cost his team more runs than Young (-31). Additionally, Beltre's 2010 season was not a product of Fenway Park, as he went .327/.370/.583 on the road. 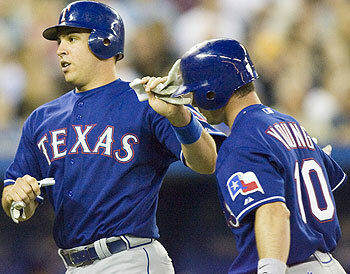 He has gone .306/.336/.521 for his career in Arlington. Still, third basemen in their mid-30s tend to age quickly and Beltre has been a bust whenever not directly motivated by money. Expect a terrific year for him in 2016, however, since he is incredible every six years and will be once again playing for a contract. Second Verse, Same as the First - After the original Washington Senators split town to become the Minnesota Twins, the District was immediately given a new baseball team in 1961, again called the Senators, who played at RFK Stadium. Shockingly, the team left town after 12 lackluster seasons. The Rangers - The team arrived in Arlington, Texas, and became the Rangers in 1972, but the move did not produce immediate dividends; the franchise failed to win a division title until the late date of 1996. Now playing in the Ballpark at Arlington, the franchise has come to be known as one of high offense and mediocre pitching. Best Trade in Team History - In 1988, the Rangers acquired Rafael Palmeiro, along with Drew Hall and Jamie Moyer, in exchange for Mitch Williams, Paul Kilgus, Steve Wilson, Curtis Wilkerson, Luis Benitez, and Pablo Delgado. Of the six Chicago-bound Rangers, only Williams performed well, and even his success was fleeting, while Palmeiro and Moyer blossomed into Hall of Fame-caliber players. Worst Trade in Team History (Where to Begin?!?!) - On July 29, 1989, the Rangers traded Sammy Sosa, Wilson Alvarez, and Scott Fletcher to the Chicago White Sox for Harold Baines and Fred Manrique. Alvarez pitched a no-hitter at the age of 21 for the White Sox and Sammy Sosa became one of the greatest homerun hitters in baseball history, while Baines barely spent a calender year with the Sox before being dealt the following year to the A's. In 1992, the Rangers sent Ruben Sierra, Bobby Witt, and Jeff Russell to the Oakland Athletics in exchange for Jose Canseco. Canseco missed most of 1993, had a solid 1994, and then wore out his welcome and was traded to the Red Sox, but not before getting all of the Texas Rangers hooked on steroids. On December 6, 2002, the Rangers traded Travis Hafner and Aaron Myette to the Cleveland Indians for Einar Diaz and Ryan Drese. Drese was a disaster with the Rangers, as most pitchers are at The Ballpark, and Diaz played one sub-par season before moving on, while Hafner has become one of the most feared hitters in baseball. For what its worth, at least they ended up trading Diaz as part of a deal to acquire Chris Young. On December 8, 2005, the Rangers traded Alfonso Soriano to the Washington Nationals for Brad Wilkerson, Armando Galarraga, and Terrmel Sledge. Soriano became the first player ever to hit 40 homeruns, 40 doubles, and steal 40 bases while leading the NL in outfield assists, while Wilkerson has struggled to keep his on-base percentage over .300. On January 6, 2006, the Rangers traded Chris Young, Adrian Gonzalez, and Terrmel Sledge to the San Diego Padres for Adam Eaton, Akinori Otsuka, and Billy Killian. Eaton played 65 innings for the Rangers, and Otsuka has been a very good reliever, while Young and Gonzalez have become two of the bright young stars of the National League. You Re-Made Your Team, Now Lie in It. The question for the Rangers, as usual, is whether their offense can score enough runs to make up for their pitching. The Rangers are heading in the right direction, despite a front office that has a penchant for missing their mark by miles. Do Alfonso Soriano, Kevin Brown, or Hank Blalock have what it takes to enter the Hall of Fame? Asher investigtes. Canseco claims to have supplied steroids to the entire state of Texas. Asher doesn't find this very hard to believe. Greatest Combination of Talent on One Team? Which team in baseball history in fact had the greatest collection of talent ever? Some Things You May Have Missed Among the neglected sights are one of thebest offensive infields ever assembled. Who should have won the AL MVP in 1996? Hint: he played part of his career with the Rangers.